This past weekend, my American housemates and I all happened to have the same four days off of school due to a fortunate overlapping of three-day workweeks and school breaks for the All Saints’ holiday. Taking advantage of some of the last non-rainy days in northern Spain of the season, we hopped in a rental car and drove from Santiago de Compostela out to San Vicente de la Barquera, a small fishing village on the Cantabrian coast about halfway between Galicia and the Basque Country. 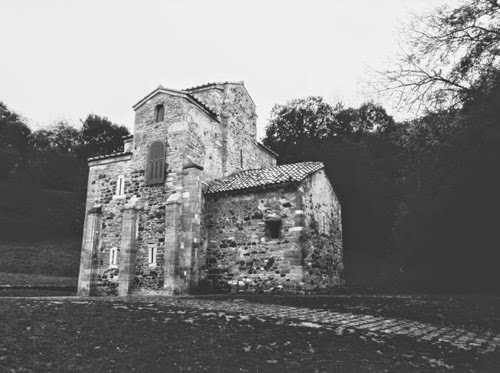 We crashed at our housemate Rachel’s boyfriend’s apartment and used San Vicente as a home base to explore the northern coast of Spain, Asturias and Cantabria. 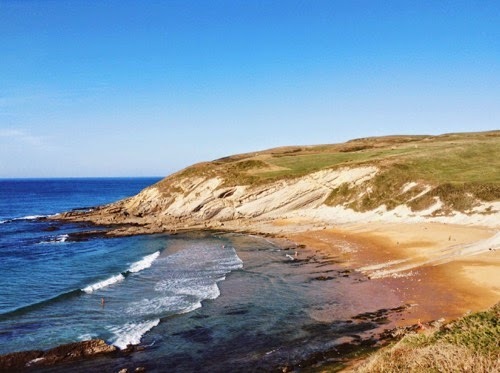 On Friday, we spent our time in Cantabria, hitting up Comillas (for architect Antoni Gaudí’s El Capricho de Gaudí house), Santillana del Mar (which did not live up to its slogan as “the most beautiful village in Spain”), two sunny beaches, and the Cueva de El Castillo, an impressive cave in its own right that also housed stunning prehistoric art. 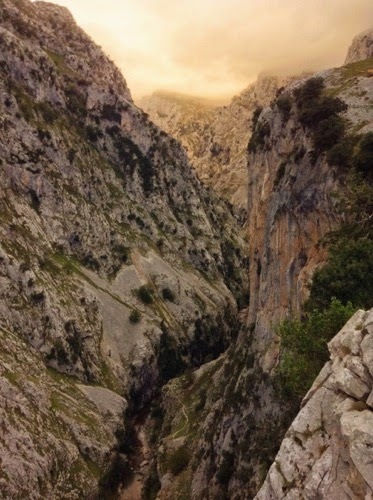 Saturday we dedicated to the Picos de Europa National Park. Coffee, sweets, and strolling were the highlights of Cangas de Onís, the gateway to the park; fancy churches and Spanish tourists were those of Covadonga. We tried to visit the Lagos de Covadonga within the park but the fog was so thick we could only see the lake shore and hear cowbells jingling playfully, mysteriously in the distance. Thankfully the rain held off long enough that we got to hike for an hour or two in the Garganta del Cares, a breathtaking river gorge that is understandably packed in summertime. 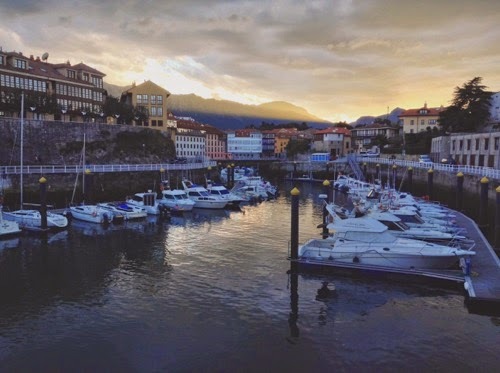 Sunday we shifted west to Asturias, going to Ribadesella for the Cueva de Tito Bustillo for more prehistoric cave art, Lastres for the pretty views, Luanco for the seaside cuisine, and Llanes, which was the most beautiful fishing village we visited the entire weekend. On our way back home to Santiago, the housemates and I spent half a day in Oviedo, the capital of Asturias. With our rental car we stuck it to the relentless rain and drove up hillsides to feel the weight of history inside three pre-Romanesque churches that date back to the 800s CE. 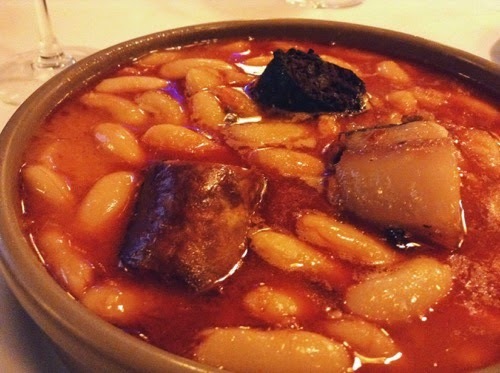 Back in town, we checked off one of Spain’s most enduring cathedrals, ate decadent carbayón sweets, and had the best fabada stews of our lives. The four days we spent along the north-central coast of Spain really brought home how similar Galicia really is to the rest of the north: both are home to endless rain (and glorious green landscapes), cheese and dairy cows are everywhere, both have traditional corncribs (hórreos vs. horrus), the Moors show up in their history barely, if at all, and many of the formative battles and legends in the Spanish mythos happened here. I was struck at how industrial the region really is. Driving through the developed triangle of Avilés-Gijón-Oviedo you see tons of factories spewing steam, smoke, and fire into the air; train tracks carry heavy freight trains and light little Feve passenger trains around the region; and aging yet functioning mines tell of the importance that mining has had in the fortunes of this far-flung part of the country. Cantabria was no different—factories, smokestacks, and industrial parks abounded between Santander the capital and Torrelavega. Very different from natural Galicia, which historically was one of the poorest parts of Spain. And I can’t think of a single city we stopped in that wasn’t along some branch of the Camino de Santiago, that medieval pilgrimage route connecting Christian Europe with the supposed burial place of the Apostle James the Greater in Santiago de Compostela (i.e., MY HOME!). 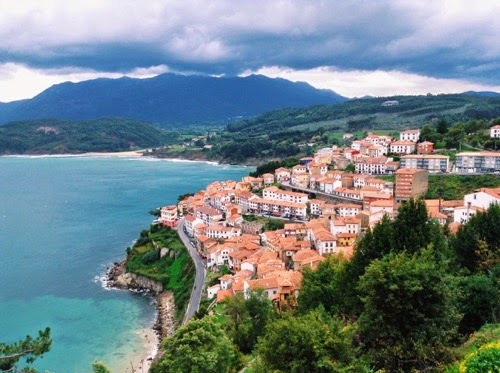 I now understand the attraction of the Camino del Norte route that hugs the Bay of Biscay before turning south in Galicia toward Santiago: it passes through beautiful village after village and past the most gorgeous scenery in the country—but it’s that mountainous terrain and steep cliffs that make this one of the most difficult and strenuous routes. The Camino Primitivo goes through Oviedo, the starting point for King Alfonso II’s pilgrimage to Santiago, the journey that started it all so many centuries ago. Have you ever spent time along Spain’s northern coast? What do Galicia, Asturias, Cantabria, and the Basque Country all share in common—and what do you think makes each unique? Tell me your thoughts below in the comments.